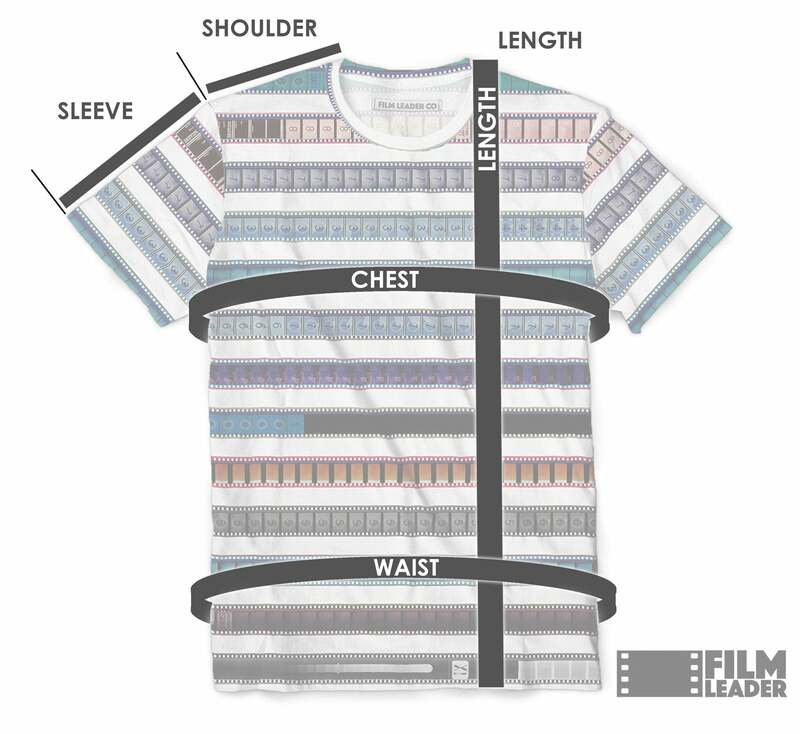 Crew Neck T Shirt with Light Grey IMAX 15/70mm Countdown - Film Leader Co. LENGTH 24" 24.75" 25.5" 26.25" 27" 27.75" 28.5" 29.75" 31"
CHEST 32" 34" 36" 38" 40" 42" 44" 46" 48"
WAIST 32" 34" 36" 38" 40" 42" 44" 46" 48"
SHOULDER 5" 5.25" 5.5" 5.75" 6" 6.25" 6.5" 6.75" 7"
SLEEVE 6.25" 6.5" 6.75" 7" 7.25" 7.5" 7.75" 8" 8.25"
Featuring countdown stripes of the largest film format ever to be shown on screen: 15 perforation 70mm film! This format is widely known as IMAX, but in the industry it's called 15/70. Each shirt is made to order, with variations in the design from shirt to shirt. Because each shirt is custom made one at a time, it may take up to 3-4 weeks to ship. Our shirts run a little smaller/larger than some other brands, so please choose your size carefully using the sizing chart link above.